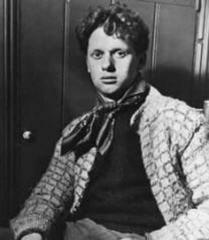 2014 marks the centenary of Dylan Thomas’ birth and the ‘Dylan Thomas 100’ festival has been created to celebrate the life and work of this controversial Welsh poet. The festival hopes to ‘raise the profile of Dylan Thomas and of writing from Wales’ and to use the centenary as an ‘opportunity to revitalise his status and the study of his work, while cultivating a new generation of creative talent’ (1). It is an initiative I completely agree with. Although I am not Welsh born and bred, I have spent the best part of my life in Wales. I went to a Welsh school and a Welsh University and I was only taught Dylan Thomas once, fleetingly, aged 15. It seems bizarre that so much emphasis is placed on the works of Shakespeare – a great writer but one that is distanced by location and time- when so little is mentioned about Dylan Thomas, a poet we can actually call our own. There could be more of a balance. But throughout his life, and even after his death, Dylan Thomas seems intent on throwing people off balance. His cryptic writing and his controversial personal life make him a ‘difficult’ poet to study. He doesn’t fit the boxes. He doesn’t make things easy. For many, Dylan Thomas was a great poet. His work inspired artists like Bob Dylan and John Lennon; his words captivated the likes of The Prince of Wales and Roald Dahl. There is something about the rolling hypnotism of his words that is impossible to ignore – especially when paired with his mellifluous Welsh lilt. He is a powerful example of Welsh talent and yet, for decades, he was more respected in America than he was in his homeland. I hope that the centenary can change this. I hope that it can encourage a wider audience to appreciate his work, to accept him into Welsh schools and universities. Dylan Thomas is a poet whose work needs to be shared. He may have been an alcoholic, he may have been a womaniser, he may have been odd looking with his ‘pink blubbery face with pop eyes and a blob nose’(4), but there are very few poets who can capture, as well as he did, the Welsh landscape, what it means to live in Wales. There are very few poets who can evoke such intense nostalgic recognition. We should be proud of him.